Mr. and Mrs. Tony Jubulis of Cheektowaga celebrated their 50th wedding anniversary with a Mass of Thanksgiving at St. Philip the Apostle Catholic Church, followed by a family dinner hosted by their children at the Lancaster Country Club. A trip to New England is planned in the fall. 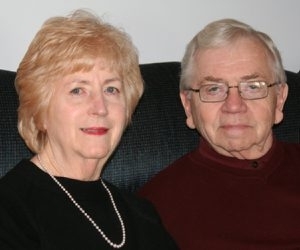 Mr. Jubulis and the former Marilyn McNally were married March 21, 1964, in St. Paul’s Catholic Church, Kenmore. Tony retired after a career in the food business, including Loblaws, Peter J. Schmitt, Intersave and Tripifoods. She is a retired registered nurse, currently working as a secretary at St. Philip the Apostle Catholic Church in Cheektowaga. They have five children and 12 grandchildren.